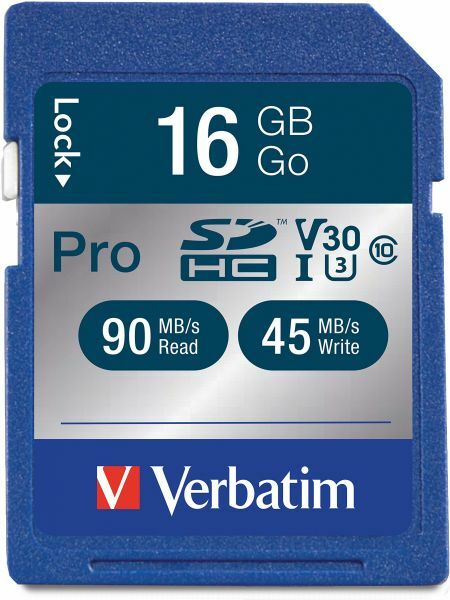 Verbatim Pro 600X SDHC UHS-1 Memory Cards host premium grade components and advanced controller technology that maximize your digital experience while delivering the quality and reliability you've come to know from the Verbatim brand. Ideal performance for the professional or enthusiast photographer, the Verbatim Pro 600X SDHC UHS-1 Memory Card features UHS-1 Interface (Ultra High Speed Interface) and supports host device bus speeds up to 104MB/second. With transfer speeds up to 600X* (90MB/sec), the Verbatim Pro 600X series memory cards maximize your ability to capture, offload and process your digital photography, that means less time spent in the studio offloading photos, and more time behind the viewfinder capturing great fast action sequence bursts or 1080p high definition video. Class 10 rated for standard HS (High Speed) interface equipped host devices. Write protect switch prevents accidental deletion. Backed by Verbatim's Limited Lifetime Warranty.